The Canadian Shield—also called the Laurentian Plateau, Laurentian Shield, Bouclier Canadien (French), or Precambrian Shield—is the massive U-shaped, almost circular region of the Earth that has extensive exposed Precambrian rock, forms the nucleus of North America, and extends from Lake Superior on the south to the Arctic Islands on the north, and from western Canada eastward to most of Greenland, including in the United States the Adirondack Mountains in the northeast and the Northern Highlands in Wisconsin. In geology, a shield is generally a large area of exposed Precambrian crystalline igneous and high-grade metamorphic rocks that form tectonically stable areas and that normally form the nucleus of continents. Most often they are bordered by belts of folded Cambrian rocks. The Canadian shield is covered by a thin layer of soil and forms the nucleus of the North American craton—an old and stable part of the continental crust that has survived the merging and splitting of continents and supercontinents for over 500 million years. In addition to its rich natural resources, including substantial deposits of such mineral ores as nickel, gold, silver, and copper, and pristine northern ecosystems, the Canadian Shield also serves as a fertile area for human beings trying to better understand the origin of life. This is because the Canadian Shield has unusually large areas of relatively exposed rock from the Archean eon, roughly 2.5 to 4 billion years ago. The first prokaryote fossils trace to this time period, and it is speculated that this geologic period encompassed the first development of an oxygen atmosphere and the first appearance of eukaryotes. Human beings, which have a role as stewards of creation, have a deep curiosity to understand nature, and this is reflected in identifying the Canadian Shield and its ecological and scientific values. An outline of the Canadian Shield would give the appearance of a warrior's shield or a giant horseshoe. It is an exposed subsection of the Laurentia craton signifying the area of greatest glacial impact (scraping down to bare rock) creating the thin soils. When the Greenland section is included, the Canadian Shield is approximately circular, bounded on the northeast by the northeast edge of Greenland, with Hudson Bay in the middle. It covers much of Greenland, and nearly half of Canada's total area, including Labrador, most of Quebec north of the St. Lawrence River, and much of Ontario, including northern sections of the southern peninsula between the Great Lakes. It also includes in Canada the central/northern portions of Manitoba away from Hudson Bay and the Great Plains, northern Saskatchewan, and a small portion of northeastern Alberta, as well as the mainland northern Canadian territories to the east of a line extended north from the Saskatchewan/Alberta border (Northwest Territories and Nunavut) (HCF, 2007). In the United States, the Canadian Shield includes the Adirondack Mountains of northern New York, the northernmost part of Lower Michigan and all of Upper Michigan, northern Wisconsin, and northeastern Minnesota. In total, the Canadian Shield covers approximately 8 million square kilometers. If underground areas are included, the Canadian Shield covers even more area. For example, in Alberta, Canada, it plunges under the mountains and plains to form a foundation under the province and it also stretches to the Western Cordillera in the west and Appalachians in the east, though the formations remain underground (HCF 2007). The underlying rock structure also includes Hudson Bay and the submerged area between North America and Greenland. However, by some definitions these submerged regions are not technically part of the Shield since they are not on the surface. The Canadian Shield is so large that the climate varies across it. Typical Canadian Shield: pines, lakes, bogs, and rock. In the southern parts, the climate is seasonal; the average temperature in the winter is -.4 degrees F (-18 degrees C), and in the summer it is 77 degrees F (25 degrees C). The growing season of about 120 days coincides with summer daylight averaging about 15 hours, while winter daylight averages about 8.5 hours. In the northern parts, the climate is very cold. The average temperatures range from 59 degrees F (15 degrees C) in the summer to -31 degrees F (-35 degrees C) in winter. The growing season is only 60 days in duration. Winter daylight hours average about 5.5 hours, and in the summer the daylight hours average about 18.5 hours. Hydrographical drainage is generally poor, the effects of glaciation being one of the reasons. 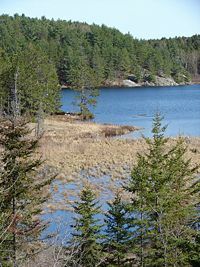 The lowlands of the Canadian Shield have soggy soil suitable for planting trees, but it contains many marshes and bogs. The rest of the region has coarse soil that does not hold moisture very well and is frozen all year round. The Canadian Shield is covered by boreal forests in the south. Forests are less dense in the north, and tundra prevails in the more northern regions. Transitional between the tundra and the boreal forests is the Northern Canadian Shield Taiga ecoregion, characterized by low-lying bushes because of the increasingly severe weather and unsuitable soil conditions (WWF, 2001). The human population tends to be scarce in the taiga, but many mammals are present in the area, such as caribou, wolverines, weasels, minks, otters, grizzlies, and black bears. The Canadian Shield is the exposed part of the North American craton or Laurentia. The exposed metamorphic rock of the Canadian Shield mostly traces to the Precambrian era, between 4.5 billion and 542 million years ago, including extensive exposed rock from the Archean eon. The Archean is set at the time period beginning with the formation of the earth's crust and the oldest earth rocks 3.8-3.96 billion years ago and extending to the Proterozoic, 2.5 billion years ago. The origin of life traces to the Archean, with prokaryote fossils known from 3.5 billion years ago. During the Archean, processes were also set in motion that prepared the foundation for multicellular life, with the development of an oxygen atmosphere and, it is speculated, possibly the appearance of the first eukaryotes around 2.7 billion years ago, near the end of the Archean (Mayr, 2001). Such a large area of exposed old rock as seen in the Canadian Shield is unusual. The current surface expression of the shield is one of very thin soil on top of the bedrock, with many bare outcrops. This arrangement was caused by severe glaciation during the last ice age, which covered the shield and scraped the rock clean. The multitude of rivers and lakes throughout the region is caused by the watersheds of the area being so young and in a state of sorting themselves out with the added effect of post-glacial rebound. The shield is considered to have been originally an area of very large mountains and much volcanic activity, but over the millennia the area was eroded to its current topographic appearance of relatively low relief (984 to 1,968.5 feet above sea level) with diverse ridges and low mountain ranges. It is considered the first region in North America to be elevated permanently above sea level, not having been subsequently submerged by encroachments of the oceans. The shield contains some of the most ancient volcanoes on earth. It has over 150 volcanic belts (now deformed and eroded down to nearly flat plains) that range from 600 to 1,200 million years old. Each belt probably grew by the coalescence of accumulations erupted from numerous vents, making the tally of volcanoes in the hundreds. Many of Canada's major ore deposits are associated with Precambrian volcanoes. Mountains have deep roots and float on denser mantle, much like an iceberg at sea. As mountains erode, their roots rise and are eroded in turn. The rocks that now form the surface of the shield were once far below the earth's surface. The high pressures and temperatures at those depths provided ideal conditions for mineralization. The North American craton is the bedrock forming the heart of the North American continent and the Canadian Shield is the largest exposed part of the craton's bedrock. The Canadian Shield is part of an ancient continent called Arctica, which was formed about 2.5 billion years ago. It was split into Greenland, Laurasia, Scotland, Siberia, East Antarctica and is now roughly situated in the Arctic around the current North Pole. The shield is one of the world's richest areas in terms of mineral ores. It is filled with substantial deposits of nickel, gold, silver, and copper. Throughout the shield, there are many mining towns extracting these minerals. The largest, and one of the best known, is Greater Sudbury, Ontario. Sudbury is an exception to the normal process of forming minerals in the shield since there is significant evidence that the Sudbury Basin is an ancient meteorite impact crater. The shield, particularly the portion in the Northwest Territories, has recently been the site of several major diamond discoveries. The kimberlite pipes in which the diamonds are found are closely associated with cratons, which provide the deep lithospheric mantle required to stabilize diamond as a mineral. The kimberlite eruptions then bring the diamonds up from over 93 miles below the surface. Currently the Ekati and Diavik mines are actively mining kimberlite diamonds. The shield is also covered by vast boreal forests that support an important logging industry. Alberta Online Encyclopedia. The Canadian Shield Region. Retrieved October 7, 2007. World Wildlife Fund. Northern Canadian Shield taiga (NAO612). Retrieved October 7, 2007.